Portrait taken by an unknown photographer of five men posed in front of a temporary studio in the early 1860s. 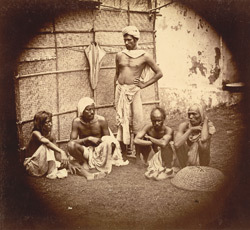 This print is from a collection of portrait studies of individuals and groups from Eastern Bengal (modern Bangladesh and Assam). It is possible that they were taken in response to the Government of India's call for photographs representing various ethnic types from across the sub-continent.